So, uh. I ran 100 miles last week. More specifically, I did it within 24 hours, and all I got was this lousy (awesome) belt buckle. I toed the line with a couple dozen other like-minded (read: crazy) folks on New Year’s Eve at 9 am. I didn’t stop moving until New Year’s Day at 8:55 am. This is my story. A year ago, my (now) wife and I signed up to run Across the Years. What’s that? 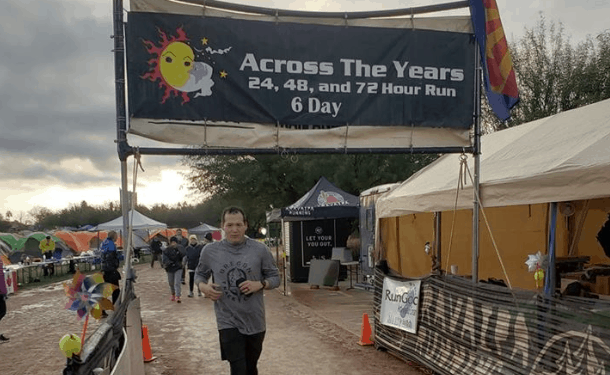 – you may ask… It’s a timed race, meaning that you sign up for a block of 24 hours, 48 hours, 72 hours, or SIX DAYS and you run (or walk or hobble or whatever you need to do) as much or as little as you’d like during that time. It’s a one-mile loop that runs through the outer concourse of Camelback Ranch’s baseball practice fields. Normally, crowds gather here in March to watch the White Sox and the Dodgers – but for a week in December / January each year – a bunch of lunatics like me come out to test ourselves. In the 2017-2018 version of the race, I got up to 50 miles and called it quits. That wasn’t really the plan, but I took a break which ended up lasting probably half an hour, and I just couldn’t muster up the will to get back out there. 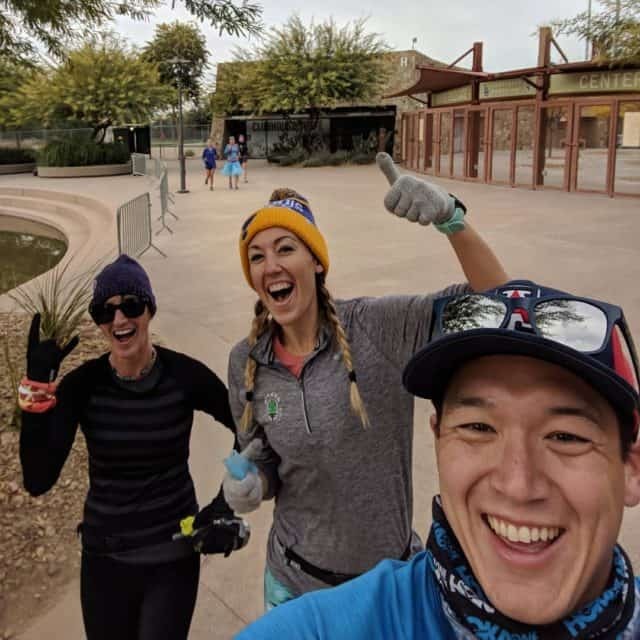 Besides, I just wanted to hit the 50-mile mark so that I’d have a little more self-confidence before running the Black Canyon 100K in February. This year, though? My goal was to run 100 miles in one go. My wife will tell you, though – I didn’t have much of a game plan. She’d probably also tell you that I didn’t train enough. She knew I could do it, but I don’t think she was as confident as I was when I started that New Year’s Eve. I’m glad she was there, though. If she had any doubts, she didn’t let them show. She ran with me every so often (as allowed) and it was nice to chat a little bit in between podcasts, music, and audiobooks that otherwise kept me company. Things would get rough at times, but her smile along with encouraging words from other friends at various times of the day (and night) were all I needed to keep my feet moving. As the clock drew closer to midnight, I started calculating how much time I’d be killing at the start/finish line to countdown the new year with Laura and take a quick swig of champagne. As soon as we did that, we were back on the course to keep moving ahead of the crowd. I say crowd because they let spectators take a lap after midnight just for kicks. I loved seeing so many people on the course with me, but I didn’t want to get stuck among the herd. I had a pace to keep and the clock was ticking. To start the whole thing, my pace was somewhere in the ballpark of 10-11 minute miles. That’s an easy run. My marathon pace is probably closer to 9-minute miles, for reference. As time went on, it got closer to a 14-minute average. Some loops took 18 minutes. Some were in the 12 range. 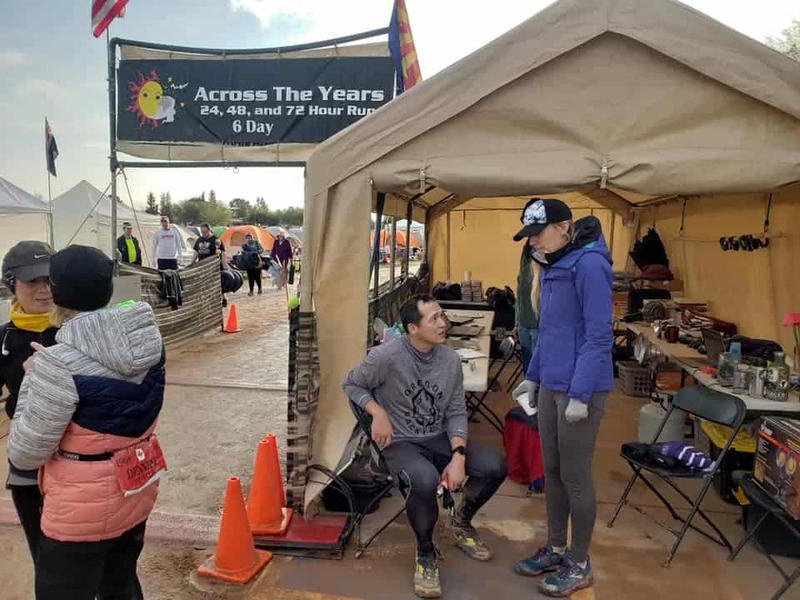 It really just depended on how I was feeling at any given moment or whether I was eating or needed a bathroom break… By the time midnight had come and gone I calculated in my head that I’d need to keep up a 14:30 average over the remaining 30+ miles. Easy enough, right? Well, that number pretty much dictated the rest of the race for me. I kept to it so much so that things really came down to the wire in the last hour. A little buffer would be nice, right? Also, I determined that I’d hit 100 miles halfway through one of my laps. Remember when I said it was a 1-mile course? Well, it’s more like 1.05 or something. I asked a friend if the tracker at the halfway point would count, and on my next lap they confirmed that I’d need to finish the entire lap before 9am – something I considered but didn’t really take into account with my lap pace. He shouted at me as I passed through and realized I had a little over 15 minutes to complete another lap. That’s within my average pace up to that point, but it lit a fire in me. I pushed as hard as I could to not come in under the gun, and as I stated at the top of this report – I finished with 5 minutes to spare. It was one of the most difficult accomplishments of my lifetime, and I’m already looking back on it with pride. One thing I didn’t think too much about was recovery. I was so focused on what I’d need to do to knock out 100 miles that I didn’t take into account just how long it would take before I’d be back to normal again. We got home late morning on New Year’s Day. After a warm bath (an underrated luxury) and a quick bite to eat, it was off to sleep (finally!). 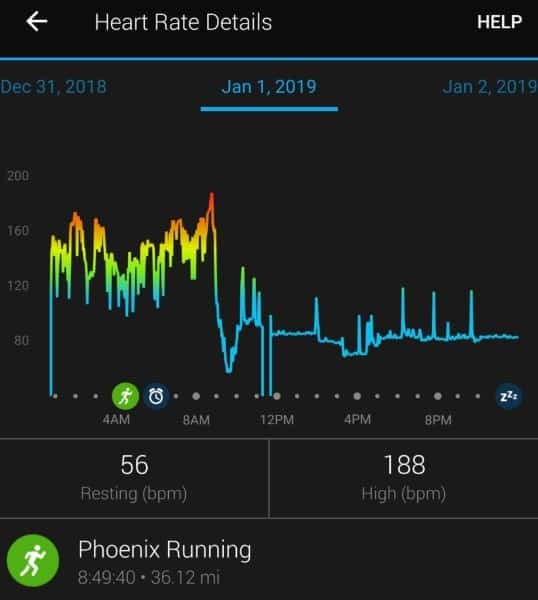 My body temperature rose again as inflammation set in everywhere and my heart rate settled into an elevated state that it wouldn’t return from until January 3rd. I’ve experienced an elevated heart rate after a tough 50K, but it never lasted more than half a day or so. This was nuts. I just kept resting and eating during that time, and once I could stand without using my arms as leverage I started walking again as much as I could muster. One thing I’ve learned from my wife the physical therapist is that active recovery is a key to rehabilitation. I’m slightly obsessed with my Garmin. Heart rate, sleep tracking, all that jazz. We’re about a week out now, and I’m not in any rush to get back to regular training, though it’ll come soon. I don’t know what my next race might be, but I now know that I CAN run 100 miles. I can do whatever I set my mind to. Just a few weeks before this race, I set a new PR for the 50K distance at McDowell Mountain Frenzy. I know, a 50K PR doesn’t necessarily mean a ton with all the variation in trails, but it still felt like a pretty good accomplishment and boosted my confidence in my preparation for the Black Canyon 100K in February 2018. Next up? Across the Years, starting the morning of New Year’s Eve and (theoretically) finishing the morning of New Year’s Day. Laura put together a game plan to take the race on conservatively and run slower than one might think to run. Overall, her strategy worked out nicely as she and her running partner kept each other going. I cranked through the half marathon distance at a decent clip. I had set a PR just months before running sub-9-minute miles, so this was no big deal. Once I got to the 50K distance, I decided to take my first extended break where I actually sat down and ate a bit of a sandwich. I figured this would be the first of many breaks like this as I ran through the night. No big deal. Yeah, so.. I started taking more breaks. Nothing big, but just decided to take care of myself along the way. Plus, my book was done at this point, so I didn’t even have that to keep me going. Music was fine, but it wasn’t nearly as distracting. Distractions are good with such a monotonous race as this. The people are great, but you can only get so excited about running a 1 mile flat loop, y’know? By the time I hit 50 miles, I was under 11.5 hours into the race. 100 miles could be doable, but I really didn’t feel like it. My motivation was shot, and I took an extended rest break. The air had gotten cold and I found a heater, and that was pretty much it for me. I’d go back out for a handful more miles, both on my own and to accompany Laura, but I was fading fast. New Year’s came around, and I celebrated with Laura and other friends. I was talking big heading into this race, in that I wanted to run the underwear beer mile after midnight and all that… Yeah, no. I layered up and laid down in the tent, not to emerge until the sun came up the next morning. Laura joined me some time later when her mileage had caught up to mine, and we crawled out into the next day to hobble around one final mile before turning in our trackers. I felt pretty good about nailing down nearly 60 miles. It wasn’t quite what I thought I’d do, but it was more than enough for this venture. And I proved to myself that I could definitely run for the 100K distance. Game on, Black Canyon. Running at McDowell Mountain Park has really grown on me in the last year. From Ragnar Trail to pacing at Javelina Jundred to just getting out there on some flat Pemberton trails… it’s a nice park with lovely single track. For this particular race, I was feeling pretty good heading into it, and I was particularly excited about the weather. It was set to be in the 40s/50s all race. The morning had a fair bit of cloud cover, and it all came together as the perfect mix for me. Personally, I’ve discovered that weather is my biggest hurdle. Direct sunlight and heat can really make me overheat quickly if I don’t have the option of ice. Uphills don’t bother me, and this race is a slow but steady climb from mile 5 to 14. I know it took a fair bit out of Laura, but it was my jam that day. The climb as we headed through the valley towards Thompson Peak couldn’t even get me down, though I know it was affecting many other runners that I ended up passing along the way. I even chatted with my brother via the speaker on my phone for about half an hour, as I was pretty much solo out there for quite a long stretch – something you generally don’t get with the looped courses until later in the day. After hanging up with him, I turned to music, and tested a theory I had earlier that week… The soundtrack to the movie Baby Driver is an EXCELLENT choice for running music. Crazy as it may sound, I started getting a bit warm by the time I got to the Mile 23 aid station. Nothing crazy, but the sun was out and that was enough to raise my internal temperature enough to threaten slowing me down. I busted out a Hulkamania bandana that I had prepared for the situation – loading it up with ice and using it to cool myself along the way towards the finish. I got to a point where I thought I might be able to finish within 6 hours, but my mileage was a bit off and I realized in the last few miles that it wouldn’t happen. 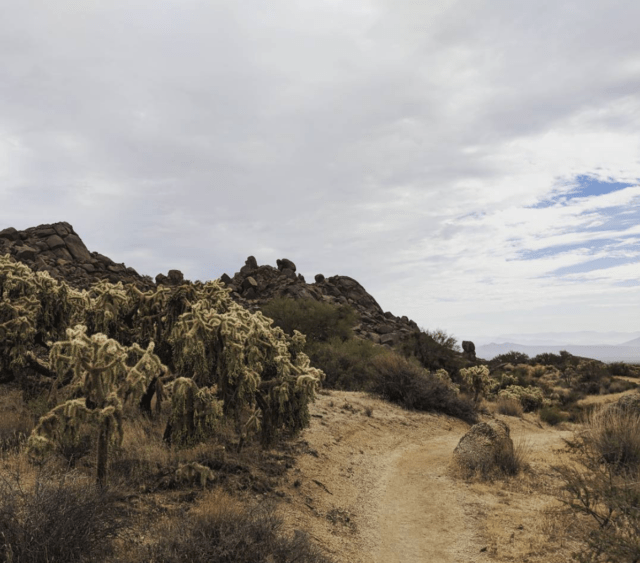 PLUS, I was headed through what is known to Ragnar Trail runners as the dreaded Yellow Loop – lots of up and down hills through the McDowell Competitive Trails, so I kind of gave up on that along the way. I persisted a steady pace, passing a few more along the way, and ultimately PR’d the 50K distance.  Any opinions shared on this website are my own, and should not reflect upon my employer or my clients.